By combining the demand for local tourism with skills learned through an INBAR programme funded by the International Fund for Agricultural Development (IFAD), seven young entrepreneurs from Chewsa Kebele in the Amhara Region of northern Ethiopia are making waves, and making money. Using bamboo to weave circular boats more commonly found in Asia, they have been able to make up to 5,000 birr (USD271) in a typical holiday season, ferrying visitors and couples around the popular waters of nearby Zengana Lake. 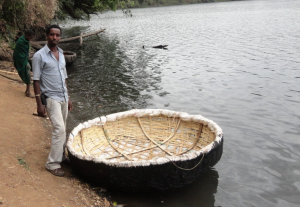 Having first heard of bamboo boats from visiting INBAR Project Coordinator Bedilu Kifle, three members of the group travelled to the INBAR office in Bahirdar at their own expense to learn more. 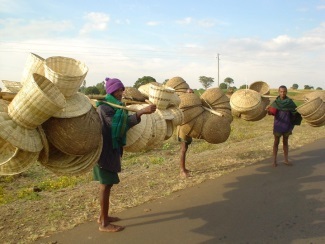 While in Bahirdar, the group benefitted from expertise shared from INBAR’s Action Research Sites in India, as they received training on construction techniques and safety procedures. Sourced almost entirely from bamboo at a cost of around 600 birr (USD32), the first boat was ready for business in just a few days. Meanwhile, as well as bringing new business and generating much-needed income to an area where average incomes for an entire year seldom exceed 1,900 (USd103), the boats are now being used to support local fishing industries and public transport. In 2012, Achamyeleh even used his boat to save the life of a local visitor who became stranded while swimming across the lake. 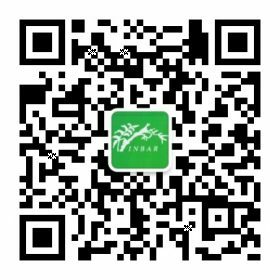 Having convinced the local community of the potential value of bamboo and its suitability for cultivation locally, INBAR has introduced this model in other areas along East Africa’s Great Rift Valley; Madagascar and Mozambique. At the same time, work with the Zengana boat owners is ensuring that plans to grow their business do not come at a cost to the environment upon which they hope to build their futures.